Arduino Display for Liquid Flow Sensors #arduino #teamarduinocc « Adafruit Industries – Makers, hackers, artists, designers and engineers! 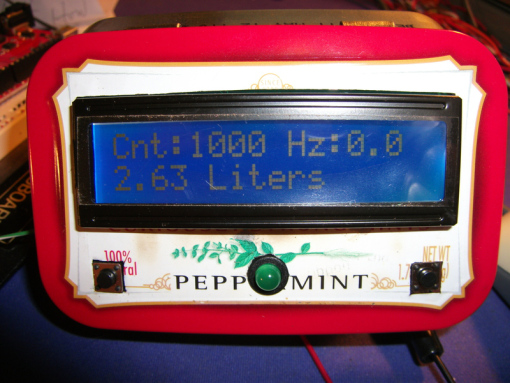 Thanks to James for sending in this Arduino project! Check out more here. This project was done for a Friend Of a Friend. He needs to monitor water flow rate and quantity for his solar heating projects. He is mainly interested in this two inch sensor but also sent along a small plastic hose bib type similar to the Adafruit 828. Both of these sensors are turbine types, water flow spins a plastic wheel which magnetically triggers a pulse output proportional to the speed at which the wheel is turning. There’s lots of these sensors made for irrigation and industrial processes. 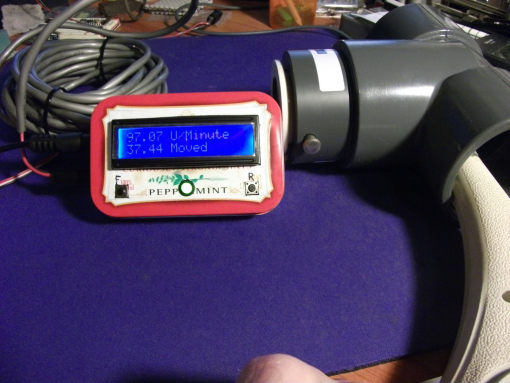 This photo shows the 228PV sensor connected to the prototype display. I am spinning the turbine with air from a heat gun. 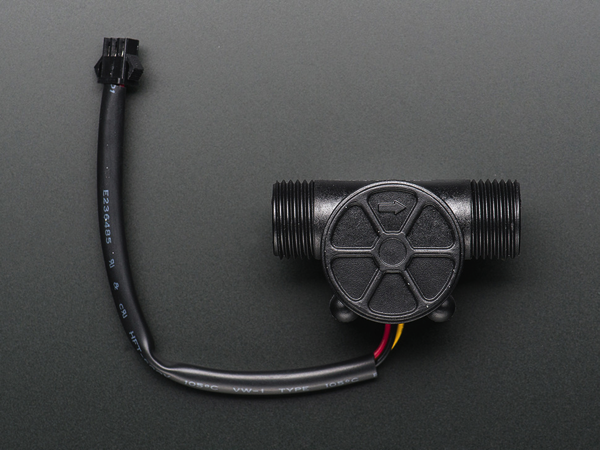 The electrical interface on the small flow meter has 3 wires, power, ground, and pulse output – relatively simple to connect to the microcontroller. But the large device has only 2 wires. It signals a pulse by shunting power to ground through a low resistance. The display must sense a pulse by looking for an increase in supply current. I designed an interface circuit that works with either unit by changing an option jumper. I constructed the interface circuit on a small piece of project board from Radio Shack (RIP). The positive supply feeds through a resistor which produces enough voltage drop when the large sensor is pulsing to trigger a digital low at the Arduino. The series resistor value is low enough that the power feed is still adequate for the small plastic sensor, so the option jumper just selects where to pick off the pulse signal. A series resistor and zener diode make sure the voltage ratings of the Arduino input pin are not exceeded. It’s a bad thing to overvolt an Arduino pin, please Don’t Ask Me How I Know This. Liquid Flow Meter – Plastic 1/2″ NPS Threaded: Measure liquid/water flow for your solar, computer cooling, or gardening project using this handy basic flow meter. This sensor sit in line with your water line, and uses a pinwheel sensor to measure how much liquid has moved through it. The pinwheel has a little magnet attached, and there’s a hall effect magnetic sensor on the other side of the plastic tube that can measure how many spins the pinwheel has made through the plastic wall. This method allows the sensor to stay safe and dry. Read more.